By July, most 3cy LBBG show very slow continuation in their moult. Some replace mantle-feathers, scapulars and coverts. Most have adult-like bare parts and under-parts. In most individuals, which may represent Dutch graellsii, at least the median coverts are actively moulted to adult-like grey feathers. Also, most birds start replacing tertials, lesser and greater coverts, from the end the month onwards. Throughout August and September, moult in the wing-coverts continues and by October most LBBG show a complete grey wing. New coverts are often easily recognized; third generation feathers are typically uniformly grey, like in adult plumage. The old retained second generation feathers show at least some brown markings in the centre and white fringes (although these fringes may be worn away and the exact pattern gets lost). As can be seen in the images of fresh third generation tails, there may be some variation in black and white division. Worn second generation rectrices are commonly seen at this age by July, i.e. a tail with a lot of black, at least with a broad black terminal tail-band. During summer, the moult of tail feathers may be either absent or already be finished. Some fresh 3rd generation tail feathers still show isolated black spots, often on the outer webs of the tail-feathers R4 or R5. Early July, some 3cy LBBG have already shed P4 and replaced P2 for a fresh adult-like primary. At the end of July some birds turn up with P5 replaced while P7 has been shed. The new third generation primaries are very adult-like grey with a white tip, totally different from the old abraded plain black-brown second generation primaries. Still, the third generation primaries differ slightly from real adult primaries as the tips are marginally smaller, the mirror on P9 is often absent, the size of the mirror on P10 is smaller and P3 and P4 show extensive sub-terminal black markings (a complete sub-terminal band on p3 and p4 is common). Of course, the outer primaries are still old and completely third generation remiges are expected by November. Another indication for third generation primaries being different from adult ones comes with time; later on in the season the outer primaries quickly turn brown. Full adult birds show blackish P5-P10. With age the feathers look to be stronger, making them less vulnerable for bleaching and wear. Secondary moult starts later in the season. Of course, the outer primaries are still old and the completion to third generation remiges are expected by November. Another indication for third generation primaries being different from adult ones comes with time; later on in the season the outer primaries quickly turn brown. Full adult birds show blackish P5-P10. With age the feathers look to be stronger, making them less vulnerable for bleaching and wear. Secondary moult starts later in the season. Some remarks on primary moult. Normally, the partial spring moult in graellsii and intermedius LBBG doesn't include the remiges. For a detailed description of this partial spring moult, see the May section. Again in July (as we saw in May and June), 3cy LBBG were encountered showing arrested moult, probably from last winter, prior to northbound migration. A full page is dedicated to discus these odd LBBG (see the page 'discusfus'). Lesser Black-backed Gull graellsii NLA 5.505.659 3CY, July 20 2016, Utrecht, the Netherlands. Metal ring NLA 5.505.659, ringed as pullus in July 2014, the Netherlands. Arrested moult: in left wing P9-P10 old, in right wing P10 old and P9 with fresh white tip. Complete moult started now, normal sequence with P1. P1-P2 new fully grown, P3 growing, P4 missing. Obvious immature rectrices and several secondaries with darker centres. Black band on bill. In this bird, coded NLA 5.505.659, an extensive moult on the wintering grounds a few months ago turned the bird in an almost identical plumage as many 4CY birds show in spring and early summer (birds that are one year older than this one). All tertails and secondaries have been replaced for 3rd generation sub-adult feathers, which are largely grey with bold white tips (and a bit of darker shades on the centres). Almost all of the primaries were included in this winter moult as well, except for the outermost feathers (P10 in the right wing and P9-P10 in the left wing). These outer primaries are still old 2nd gen, and in fact the only clue for its true age, if this bird was not ringed as pullus. Lesser Black-backed Gull graellsii 4R4:C 3CY, July & November 2016, Matosinhos, Portugal. Picture: José Marques. Lesser Black-backed Gull graellsii F:117 3CY, July 26 2016, Praia de Mira, Coimbra, Portugal. Picture: José Marques. Lesser Black-backed Gull graellsii F:121 3CY, July 26 2016, Praia de Mira, Coimbra, Portugal. Picture: José Marques. Lesser Black-backed Gull graellsii 0CP1 3CY, July 26 2016, Praia de Mira, Coimbra, Portugal. Picture: José Marques. Lesser Black-backed Gull graellsii 1CL0 3CY, July 26 2016, Praia de Mira, Coimbra, Portugal. Picture: José Marques. Lesser Black-backed Gull graellsii 5CS5 3CY, July 26 2016, Praia de Mira, Coimbra, Portugal. Picture: José Marques. Lesser Black-backed Gull graellsii 9FF3 2CY-3CY, January 2016 - July 2017, Matosinhos, Portugal. Picture: José Marques. Lesser Black-backed Gull graellsii J+P 3CY, July 26 2016, Praia de Mira, Coimbra, Portugal. Picture: José Marques. LBBG W2XN 3cy July 11 2005, Neeltje Jans, the Netherlands. Picture Pim Wolf. LBBG T069 3cy July 24 2013, Utrecht, the Netherlands. Picture: Herman Bouman. Lesser Black-backed Gull graellsii 3:APK 3CY, July 26 2016, Praia de Mira, Coimbra, Portugal. Picture: José Marques. Lesser Black-backed Gull graellsii 3:AUD 3CY, July 26 2016, Praia de Mira, Coimbra, Portugal. Picture: José Marques. Lesser Black-backed Gull graellsii R:T1A 3CY-4CY, April 2015 & March 2016, Leixões harbour, Matosinhos, Portugal. Picture: José Marques. Lesser Black-backed Gull graellsii R:V7K 3CY, July 26 2016, Praia de Mira, Coimbra, Portugal. Picture: José Marques. LBBG 419N 3cy July 19 2008, Calais, NW France. Picture: Jean-Michel Sauvage. Lesser Black-backed Gull graellsii HBA.T 3CY, July 29 2016, Leixões harbour, Matosinhos, Portugal. Picture: José Marques. Lesser Black-backed Gull graellsii RLA.N 2CY-3CY, July -August 2016 & July 2017, Utrecht, the Netherlands. LBBG L-106x34 3cy July 05 2005, Amsterdam, the Netherlands. Picture Ruud Altenburg. LBBG L-108932 3cy July 09 2005, Amsterdam, the Netherlands. Picture Ruud Altenburg. LBBG 5.362.238 3cy July 05 2005, Amsterdam, the Netherlands. Picture Ruud Altenburg. LBBG 5.412.037 3cy July 17 2005, Amsterdam, the Netherlands. LBBG 5.412.042 3cy July 17 2005, Amsterdam, the Netherlands. LBBG 5.412.153 3cy July 03-09 2005, Amsterdam, the Netherlands. Picture Ruud Altenburg. LBBG 5.414.464 3cy July 04 2005, Amsterdam, the Netherlands. LBBG 5.462.260 3cy July 20 2012, Barneveld Waste dump, the Netherlands. Picture: Maarten van Kleinwee. 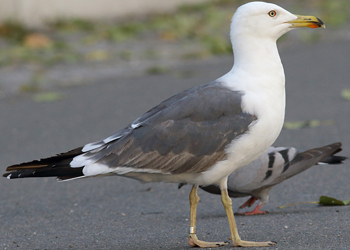 Lesser Black-backed Gull graellsii NLA 5.469.997 3CY, July 07 2014, Katwijk, the Netherlands. Lesser Black-backed Gull graellsii NLA 5.505.659 3CY, July 20 2016, Utrecht, the Netherlands. Arrested moult. Lesser Black-backed Gull graellsii JV 2CY-3CY, September 2016 & March-July 2017, Matosinhos, Portugal. Picture: José Marques. Lesser Black-backed Gull graellsii 0.+ 3CY, June & July 2016, Utrecht, the Netherlands. LBBG 3.K 3cy July 11 2013, Utrecht, the Netherlands. Picture: Frank van der Meer. LBBG 4.H 3cy July & August 2013, Utrecht, the Netherlands. Picture: Herman Bouman. LBBG JL 3cy July 29, 2011, Barneveld, the Netherlands. Picture Maarten van Kleinwee. LBBG K5 3cy July 13 2005, Dordrecht, the Netherlands. LBBG PCAC 3cy July 06 2008, Amsterdam, the Netherlands. Picture: Ruud Altenburg. Lesser Black-backed Gull graellsii HX51 3CY, July 16 2015, Tilburg, the Netherlands. Picture: Merijn Loeve. Lesser Black-backed Gull intermedius V.X8V 3CY, July 26 2016, Praia de Mira, Coimbra, Portugal. Picture: José Marques. LBBG J4A3 3cy July 25 & August 21 2003, IJmuiden, the Netherlands. LBBG J7EU 3cy July 26 2011, Barneveld, the Netherlands. Picture: Herman Bouman. Lesser Black-backed Gull intermedius J8XV 3CY, July 25 2015, Neeltje Jans, the Netherlands. LBBG JJ6L 3cy July & August 2013, Utrecht, the Netherlands. Picture: Herman Bouman. LBBG JZZ7 2cy-3cy-4cy 2010-2012. Pictures Christian Pedersen, Maarten van Kleinwee & Theo Muusse. LBBG 3CY, July 18 2013, Katwijk, the Netherlands. P4/P6. LBBG 3CY, July 18 2013, Katwijk, the Netherlands. P3/P6. LBBG 3CY, July 18 2013, Katwijk, the Netherlands. P2/P4. LBBG 3CY, July 09 2013, Katwijk, the Netherlands. P3/P6. Lesser Black-backed Gull graellsii 3CY, July 07 2013, Katwijk, the Netherlands. LBBG 3CY, July 09 2013, Katwijk, the Netherlands. P5/P8. Lesser Black-backed Gull 3CY, July 11 2016, Utrecht, the Netherlands. LBBG 3cy July 06 2001, IJmuiden, the Netherlands. In many respects fuscus-like. LBBG 3cy July 07 2001, IJmuiden, the Netherlands. Arrested moult. Grey tone like graellsii.